Keeps vehicle and trailer from moving. Re-hitch with confidence. Solidly constructed of durable poly..
Chocks keeps trailer in place so it can be re-hitched with confidence. Solidly constructed of durabl.. Prevents trailer tongue wheel from rolling on the pavement or sinking into soft ground. Heavy duty, ..
Stabilize your trailer with a single piece of equipment. 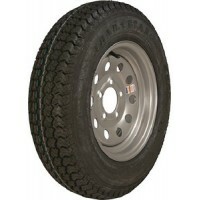 Secure tandem tires to prevent movement whi..
Theft-resistant locking cap fits over wheel studs (up to 9/16" dia.) to deter spare tire theft. Remo.. Mounts tire up and out from trailer frame for that custom trailer look. 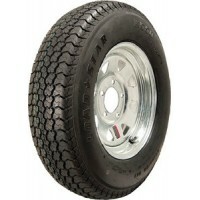 Heavy-duty, welded and reinf..
Bolts tire to trailer tongue to keep it neatly out of the way. 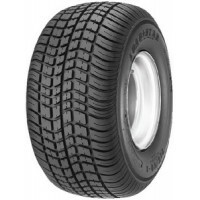 Heavy duty 1/2" diameter construction.. Heavy-duty tire carrier holds up to a 16-1/2" tire, 4, 5 or 6 lug. The carrier has a Galva-tec finis.. 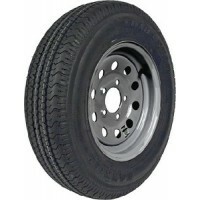 Fits over wheel studs up to 9/16" dia. to prevent spare tire theft. Removable plug permits longer wh..
Tire chock set pair Pack: 1 (Pr.).. 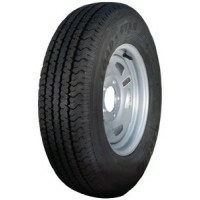 205/65-10 b/5h galv k399 Tire: 205/65-10 K399Finish: GalvanizedWheel: 10 x 6 5H SolidLoad Range: B..
205/65-10 c/5h galv Tire: 205/65-10 K399Finish: GalvanizedWheel: 10 x 6 5H SolidLoad Range: C..
205/65-10 c/5h wh k399 Tire: 205/65-10 K399Finish: WhiteWheel: 10 x 6 5H SolidLoad Range: C..
205/65-10 e/5h galv k399 Tire: 205/65-10 K399Finish: GalvanizedWheel: 10 x 6 5H SolidLoad Range: E..
205/65-10 e/5h wh k399 Tire: 205/65-10 K399Finish: WhiteWheel: 10 x 6 5H SolidLoad Range: E.. 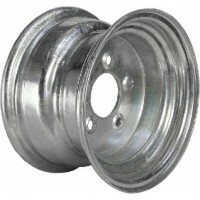 Painted wheels have e-coat and powder coat finish for a long lasting finish. 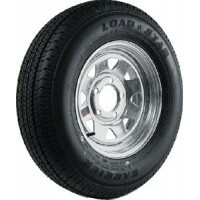 Max Load: 1200Rim: 10 X..
480-12 b/5h spk wh str k353 Tire: 480-12 K353 BIASFinish: White w/ StripeWheel: 5H SPOKELoad Range: ..
480-12 b/4h mod wh str k353 Tire: 480-12 K353 BIASFinish: White w/ StripeWheel: 4H MODULARLoad Range..
480-12 b/4h spk k353 galv Tire: 480-12 K353 BIASFinish: GalvanizedWheel: 4H SPOKELoad Range: B..
480-12 b/4h mod galv k353 Tire: 480-12 K353 BIASFinish: GalvanizedWheel: 4H MODULARLoad Range: B..
480-12 b/4h wh str k353 Tire: 480-12 K353 BIASFinish: White w/ StripeWheel: 4H SPOKELoad Range: B..
530-12 b/4h spk galv k353 Tire: 530-12 K353 BIASFinish: GalvanizedWheel: 4H SPOKELoad Range: B..
480-12 b/5h spk galv k353 Tire: 480-12 K353 BIASFinish: GalvanizedWheel: 5H SPOKELoad Range: B..
480-12 b/5h mod galv k353 Tire: 480-12 K353 BIASFinish: GalvanizedWheel: 5H MODULARLoad Range: B..
480-12 b/5h mod wh str k353 Tire: 480-12 K353 BIASFinish: White w/ StripeWheel: 5H MODULARLoad Range..
530-12 c/4h spk wh str k353 Tire: 530-12 K353 BIASFinish: White w/ StripeWheel: 4H SPOKELoad Range: ..
530-12 b/4h mod galv k353 Tire: 530-12 K353 BIASFinish: GalvanizedWheel: 4H MODULARLoad Range: B..
530-12 c/5h spk wh str k353 Tire: 530-12 K353 BIASFinish: White w/ StripeWheel: 5H SPOKELoad Range: ..
530-12 b/5h mod galv k353 Tire: 530-12 K353 BIASFinish: GalvanizedWheel: 5H MODULARLoad Range: B..
530-12 b/5h spk galv k353 Tire: 530-12 K353 BIASFinish: GalvanizedWheel: 5H SPOKELoad Range: B..
530-12 b/5h spk wh str l353 Tire: 530-12 K353 BIASFinish: White w/ StripeWheel: 5H SPOKELoad Range: ..
530-12 c/4h mod galv k353 Tire: 530-12 K353 BIASFinish: GalvanizedWheel: 4H MODULARLoad Range: C..
530-12 c/4h spk galv k353 Tire: 530-12 K353 BIASFinish: GalvanizedWheel: 4H SPOKELoad Range: C..
530-12 d/5h spk galv k353 Tire: 530-12 K353 BIASFinish: GalvanizedWheel: 5H SPOKELoad Range: D..
530-12 c/5h mod galv k353 Tire: 530-12 K353 BIASFinish: GalvanizedWheel: 5H MODULARLoad Range: C..
530-12 c/5h spk galv k353 Tire: 530-12 K353 BIASFinish: GalvanizedWheel: 5H SPOKELoad Range: C..
530-12 d/5h mod galv k353 Tire: 530-12 K353 BIASFinish: GalvanizedWheel: 5H MODULARLoad Range: D.. 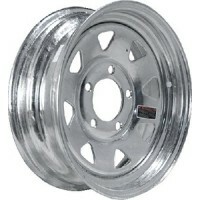 Painted wheels have e-coat and powder coat finish for a long lasting finish. 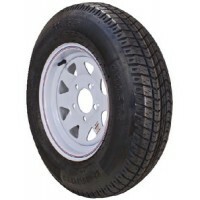 Max Load: 1250Rim: 12 X..
St175/80d13 b/5h mod wh str lo Tire: ST175/80D-13 K550 BIASFinish: White w/StripeWheel: 5H ModularLo..
St175/80d13 b/5h spk galv load Tire: ST175/80D-13 K550 BIASFinish: GalvanizedWheel: 5H SpokeLoad Ran..
St175/80d13 b/5h spk wh str lo Tire: ST175/80D-13 K550 BIASFinish: White w/StripeWheel: 5H SpokeLoad..
St175/80d13 c/5h blade silv Tire: ST175/80D-13 K550 BIASFinish: SilverWheel: 5H BladeLoad Range: C..
St175/80d13 c/5h mod galv load Tire: ST175/80D-13 K550 BIASFinish: GalvanizedWheel: 5H ModularLoad R..
St175/80d13 c/5h mod silver Tire: ST175/80D-13 K550 BIASFinish: SilverWheel: 5H ModularLoad Range: C..
St175/80d13 c/5h mod wh str lo Tire: ST175/80D-13 K550 BIASFinish: White w/StripeWheel: 5H ModularLo..
St175/80d13 c/5h spk galv load Tire: ST175/80D-13 K550 BIASFinish: GalvanizedWheel: 5H SpokeLoad Ran..
St175/80d13 c/5h spk silver Tire: ST175/80D-13 K550 BIASFinish: SilverWheel: 5H SpokeLoad Range: C..
St175/80d13 c/5h spk wh str lo Tire: ST175/80D-13 K550 BIASFinish: White w/StripeWheel: 5H SpokeLoad..
St185/80d13 d/5h mod galv Tire: ST185/80D-13 BIASFinish: GalvanizedWheel: 5H ModularLoad Range: D..
St185/80d13 d/5h spoke galv Tire: ST185/80D-13 BIASFinish: GalvanizedWheel: 5H SpokeLoad Range: D..
St175/80r13 c/5h blade silv Tire: ST175/80R-13 RADIALFinish: SilverWheel: 5H BladeLoad Range: C..
St175/80r13 c/5h mod galv Tire: ST175/80R-13 RADIALFinish: GalvanizedWheel: 5H ModularLoad Range: C..
St175/80r13 c/5h mod wh Tire: ST175/80R-13 RADIALFinish: White w/o StripeWheel: 5H ModularLoad Range..
St175/80r13 c/5h spk galv karr Tire: ST175/80R-13 RADIALFinish: GalvanizedWheel: 5H SpokeLoad Range:..
St175/80r13 c/5h spk wh str ka Tire: ST175/80R-13 RADIALFinish: White w/StripeWheel: 5H SpokeLoad Ra.. 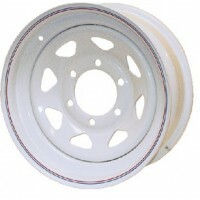 Painted wheels have e-coat and powder coat finish for a long lasting finish. 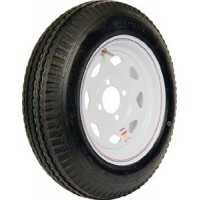 Max Load: 1660Rim: 13 X..